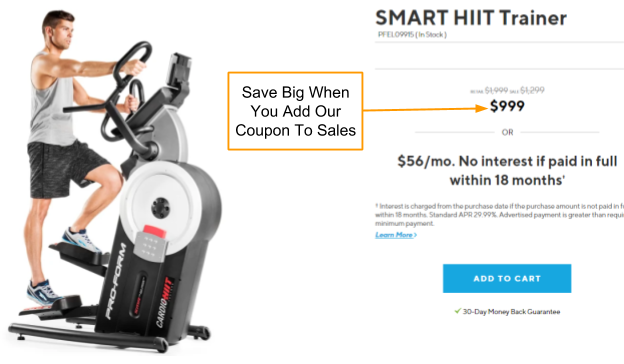 Pick up the ProForm SMART HIIT Trainer at a sizable discount by using the coupon below. Applying the ProForm coupon to your purchase of ProForm equipment is a nearly effortless process. Allow website redirection to the ProForm site. Check the “Order Discount” area for the applied discount. Finish checking out and enjoy the saving! As you can see, using the coupon is straightforward and uncomplicated. There are no other steps to take outside of the ones we have detailed above. The ProForm SMART HIIT Trainer is a quality cross-training machine which at full price will run you $1,999. It often goes on sale on ProForm for only $999, making the HIIT Trainer an excellent deal which you can stack the ProForm Coupon 2019 coupon code onto to receive this piece of equipment for an even lower price! 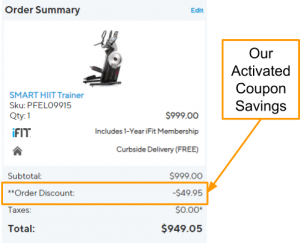 Once you have clicked on the coupon link and gone to ProForm’s website, go ahead and place the HIIT Trainer into your shopping cart. To make sure that the 2019 ProForm coupon worked, check the Item Savings section of your shopping summary. 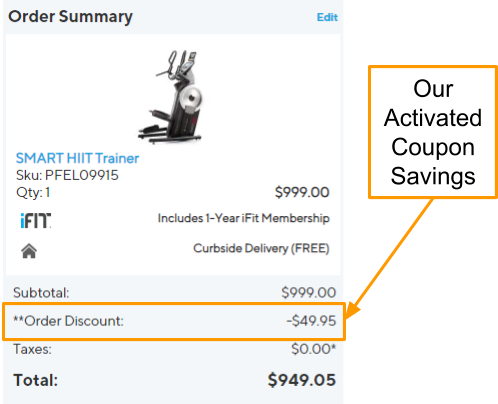 It should show a 5% discount off of the HIIT Trainer’s current price. If everything is in order, go ahead and finish your shopping. As displayed by the above screenshots, even if there is a sale happening on the ProForm website, this ProForm promo code will give you a guaranteed discount on ProForm products over $899. So, whether you buy at full price or during a holiday sale such as Memorial Day or Black Friday, you can feel confident in the ProForm promo code always coming through for you. If you’ve reached the point where you are searching for a ProForm coupon for 2019, it is likely that you have already completed your research on the various cardio machines you could have purchased. However, sometimes a refresher can be helpful before you buy. So, for more information on the specifications of the HIIT Trainer, read the below specs. There are certain qualities which make the HIIT Trainer a great option when it comes to looking for a top quality cardio machine. Innovative construction – The HIIT Trainer is unique in its construction, blending the qualities of a stepping machine with the gliding motion of an elliptical. Because of this blend, the HIIT Trainer is also great for homes which don’t have a lot of space for workout equipment as it only measures 29.25″ wide, 52″ long, and 66.7″ tall. Those dimensions are much smaller than many treadmills and ellipticals. Feature-filled – A large draw when it comes to ProForm machines is the fact that they are absolutely packed with features. There are not only handlebar heart rate monitoring sensors, but also a wireless monitoring chest strap is included, so your HIIT workouts can be more accurate in tracking your exertion. The HIIT Trainer also has a 7” backlit display with a tablet holder mounted over the console so you can track workouts while having secure entertainment. Full body workout – Some cardio workout machines don’t give you a full body workout, but the HIIT Trainer will push your whole body. With 32 workout programs and iFit, you will be able to try out tons of excellent workouts which have been created by personal trainers, with a focus on top-notch results. If you want this fat-blasting cardio machine in your home with the help of the ProForm coupon, you need to buy the HIIT Trainer online from ProForm’s official website. That is the only way our coupon code will work. So, stick to our steps, and you will soon have the HIIT Trainer at a discount.